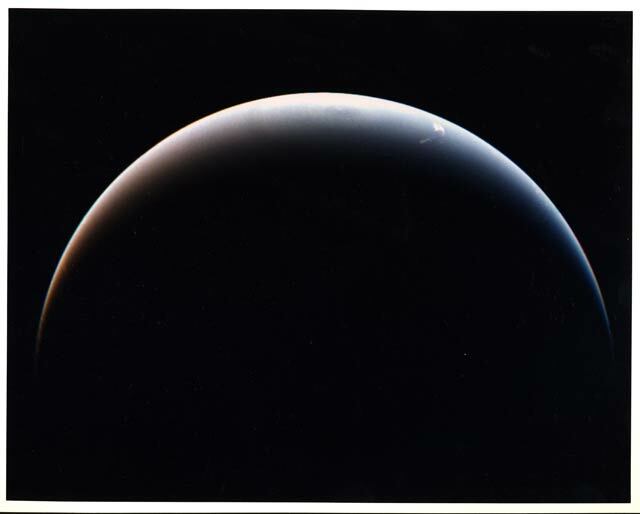 This post-encounter view of the south pole of Neptune was obtained after Voyager 2 passed the planet and sped away on a southward-trending trajectory. Looking back from 560,000 miles, Voyager's camera saw features as small as seventy-five miles in diameter. The angle between the Sun, the center of the planet, and the spacecraft is 137 degrees, so the entire south-polar region is illuminated. Near the bright limb, clouds located at 71 and 42 degrees south latitude rotate eastward onto Neptune's night side. A bright cloud at the bottom center of this image lies within 1.5 degrees of Neptune's south pole, which has been determined from the orbits of the planet's rings and satellites. Scientists believed this feature was created by an organized circulation around the pole, which forms a clear 'eye' at the center of the system.